We will all have been horrified but not surprised by yesterday’s events in Gaza. 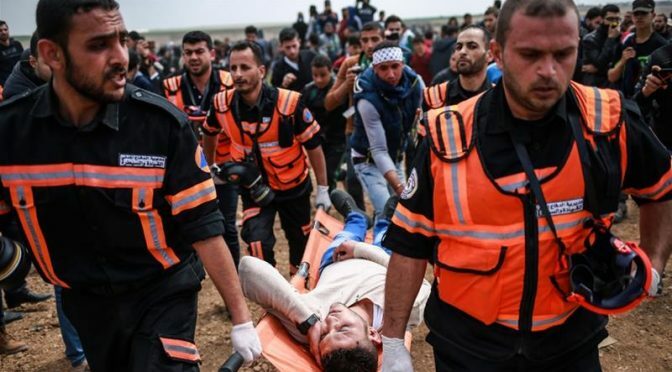 At least 15 Palestinians have been killed and more than 1,400 others wounded by Israeli forces as thousands marched near Gaza’s border with Israel in a major demonstration marking the 42nd anniversary of Land Day. Israeli forces fired live ammunition at protesters and used tear gas to push them back from a heavily fortified fence, according to the Palestinian Ministry of Health. STOP ISRAEL’S KILLING OF PALESTINIANS!!! END ISRAEL’S ATTACKS ON GAZA!!! WRITE TO BORIS JOHNSON NOW!! !